Dorset and Katie Wynia are training the volunteers on the first day. 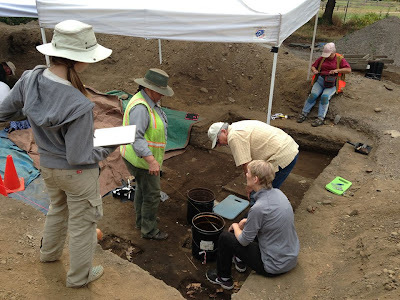 Well, the field school is now over and we have begun the next phase of excavations with the Oregon Archaeological Society. This is a less frenetic pace, as the lecture series is now over, the work at the Spruce Mill is completed and we have volunteers out on Wed, Friday and Saturday. On Tuesdays and Thursdays, we catch up on paperwork and finish work that the volunteers have left us. We have been working at the Little Proulx site with the volunteers and are completing the removal of the clay-lined house floor. There is a significant concentration of artifacts in the eastern part of the house and appear to have encountered the western edge of the house floor in units pictured above. Surprisingly we have not yet encountered the hearth. the Little Prouxl House Site. the William Kaulehelehe house site. We are also finishing up work at the William Kaulehelehe house site. A feature that lines up with the hearth may be a footing feature, which also incidentally lines up nicely with the southern wall of our reconstructed House 1 (the Engage' house). We appear to be on the north wall of the structure. On excavation of the area immediately west of this feature, a bit of clay house floor was identified and a curious set of metal fragments. These appear to be part of a tin (perhaps a tea tin) or the lid to a can or jar. At first they appeared to have an Irish theme, with a harp and possibly a clover, but on closer examination we have discerned it is the royal coat of arms of the United Kingdom. As noted by Meagan Huff from the Fort Vancouver Facebook page, "The top fragment is half of a crown, the second from the top contains part of the phrase "Honi soit qui mal y pense," the motto of the Order of the Garter. The fragment third from the top has two barely-visible lions, which represent England. 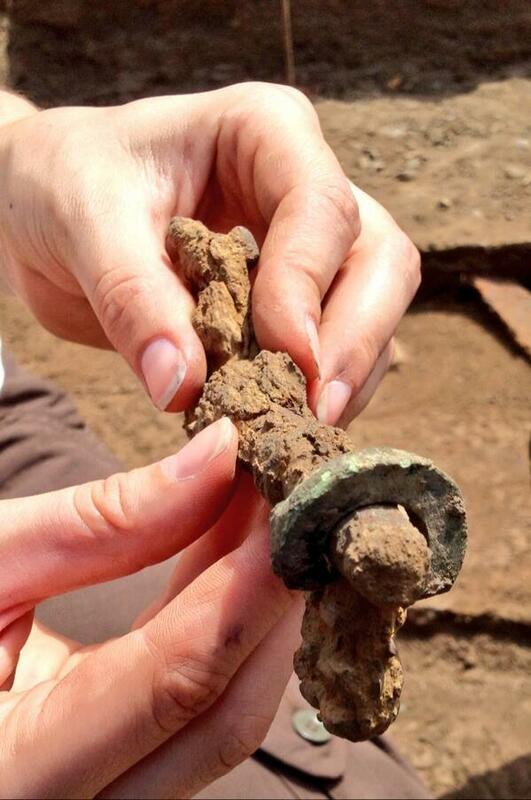 The bottom fragment has a harp, representing Ireland. The banner below it would have contained the words "Dieu et mon droit," the motto of the English monarchs. Research into what this object was for will be ongoing although its presence at a Hawaiian minister's house is quite intriguing with its statement on colonialism and identity with the British empire. The change in pace has also given me the opportunity to work more closely with the digital forms and iPads to directly explore their use in the field. A couple of thoughts after a week. I found the same issues with the glare from the iPads that the students did, particularly when holding them level over the excavation units to attempt to get a plan view of a level or feature. Even with the brightness increased to maximum, it was difficult at times to get a view of the unit and snap the picture and not lose part of the unit in the image. This usually required a few shots to get the images I wanted. Not a huge issue but an aggravation. The nice thing is that the camera is available at any time for photographing, so I am taking many more images than I would normally. Another benefit is the ability to use photos to help draw shapes. Last week I was unhappy with the way in which a mule shoe had been drawn on the house floor by one of the students. In order to get a better drawing, I took an image of the artifact in-situ, imported it into my level form, then scaled it to the correct size and location, zoomed in and traced the edges of the artifact. This was done much more accurately and quickly than the hand-drawn method. I have since tried this method with unit level rocks and the edges of surfaces/floors to improve the quality of the drawings. I think this has been done to good benefit. Once the image is traced, the photo is deleted leaving only the line drawing work. I have been working on some fairly complex levels, with a variety of objects, sampling locations and artifact recording. The forms seem to take a lot of time, probably longer than a paper form in the field. The good thing is it is the result is quite legible (a chronic problem for some researchers and students) and the data can be extracted out of the form. I think I like the annotation capabilities the best. In reviewing the notes from the field school, I have seen that some of the students were quite unhappy with the iDraw program for drawing profiles, and felt they could draw the profiles much faster using paper and pencil (in fact some of them did). While this may be a factor of unfamiliarity with the program and use of a tablet computer as much as frustration with the speed of entry, there are likely some valid thoughts. I will explore the use of iDraw to annotate some of these student profiles this week and will report back on its use later. 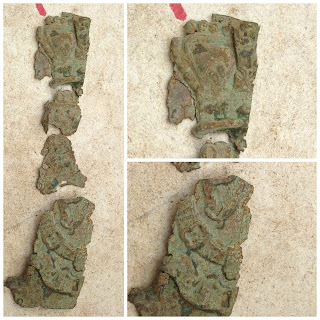 Regardless, the longest time expended in the field, however, is still the bagging and recording of artifacts, particularly when there are a lot of artifact bags (a typical problem of historical archaeological sites). I will need to think about a means to improve the speed of this process with tablet computers.